Situational awareness: Office of George H.W. Bush on his wife Barbara — "Following a recent series of hospitalizations, and after consulting her family and doctors, Mrs. Bush, now age 92, has decided not to seek additional medical treatment and will instead focus on comfort care." Globally consequential news, breaking moments ago: French President Emmanuel Macron claimed in a television interview that France has convinced President Trump that it is "necessary" to remain in Syria "long-term," according to the AFP. 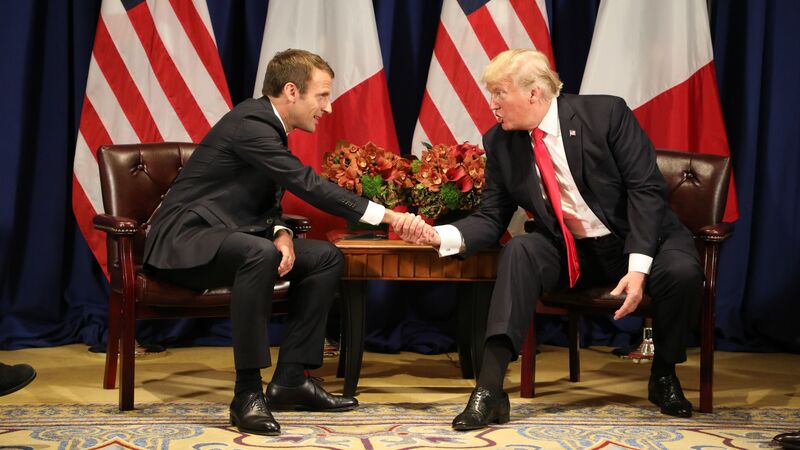 "Ten days ago, President Trump was saying the United States of America had a duty to disengage from Syria," said Macron, according to Agence France-Presse White House correspondent Jérôme Cartillier. "We convinced him it was necessary to stay. I assure you, we have convinced him that it is necessary to stay for the long-term." Trump thinks Syria is a "dump" that probably can't be fixed — though he'd be happy to let Russia try. He thinks it's a waste of lives and money and that the U.S. gets "nothing" for its involvement in Syria, according to multiple sources familiar with his thinking. However, when Trump sees the images of gassed children, he flips in the other direction and issues missiles to Syria — as he did on Friday and last year when news reports and allied intelligence indicated Assad had used chemical weapons to murder Syrian civilians. But, but, but: Trump's apparent reversal on Syria wouldn't be the first time he's backflipped on the foreign policy instincts he trumpeted during the campaign. Last year, Trump told his aides over and over that he wanted to get out of Afghanistan — citing the same arguments he used for Syria and previously to argue that the Iraq War was a waste of lives and money. But his national security team, led by Defense Secretary James Mattis, ultimately persuaded Trump to keep America in Afghanistan. 2. Scoop: "Why would Mike do that?" Trump declared "Mission Accomplished!" on Saturday and administration officials are trying to distance him from George W. Bush's embarrassing declaration about the Iraq War in 2003. Officials are saying Trump only meant that the narrow mission on Friday night — of destroying Syrian chemical weapons facilities — succeeded. Wall Street Journal: "Syrian armed forces on Sunday unleashed airstrikes against rebels and shelled what rescue workers said were civilian homes, demonstrating President Bashar al-Assad’s undiminished ability to wage the civil war a day after a U.S.-led missile attack." Washington Post: "U.S.-led strikes against Syrian chemical weapons facilities prompted defiant celebrations in Damascus on Saturday as it became clear that the limited attack posed no immediate threat to President Bashar al-Assad’s hold on power and would likely have no impact on the trajectory of the Syrian war." The bottom line: Assad looks perfectly safe in his Russo-Iranian cocoon. What's next: On CBS' "Face the Nation" today, Nikki Haley told host Margaret Brennan that the Trump administration will be imposing additional sanctions against Russia. "Secretary Mnuchin will be announcing those on Monday if he hasn't already and they will go directly to any sort of companies that were dealing with equipment related to Assad and chemical weapons use." Tax filing deadline is Tuesday. So the Trump administration and congressional Republicans plan to use this week to sell their tax reform plan and move legislation — that will likely never pass the Senate — to reform the IRS. The House will vote on two bills to redesign the IRS. The Senate probably won't touch either this year. The Senate expects to vote on "The Tribal Labor Sovereignty Act" — a law pushed by Kansas Sen. Jerry Moran, and supported by more than 160 Native American tribes. The law would give tribal governments the right to determine their own employment practices. Opponents condemn the law for exempting Native American casinos from a federal labor law that, among other things, allows workers to unionize. Monday: Trump hosts a tax event with small businesses in Florida. Tuesday and Wednesday: The President and First Lady host the Japanese Prime Minister Shinzo Abe and his wife at Mar-a-Lago. Thursday: Trump visits Joint Interagency Task Force South. We’re deeply saddened by the news that former First Lady Barbara Bush's health is failing. She’s won legions of fans not just for her poise and grace but also for her extremely sharp wit and penchant for the hilarious. One of the best examples came in March of 1990, shortly after news broke that then-President George H. W. Bush banned broccoli from Air Force One. In the wake of the scandal — and during a slow news day, the L.A. Times pointed out — the California Broccoli Shippers sent ten tons of the calcium-rich vegetable to the White House. Barbara Bush met them on the White House lawn, and hoisted up a ribbon-bedecked bouquet of the vegetable (Katerina Ang of Dow Jones has a photo here). “[V]irtually the entire news-starved White House press corps arrayed itself on the sunny South Lawn to stare at three cardboard boxes of high-in-fiber, loaded-with-vitamins California produce,” the L.A. Times reported. "Millie [the Bushes' English Springer Spaniel] and I thank you for the broccoli. We'll eat it," Mrs. Bush said of the three boxes of green veggies that arrived at the White House. But, as for her husband, the President: "If his own blessed mother can't make him eat broccoli, I give up.” For her part, "I am never going to eat pork rinds, ever," she said, referring to a high-salt snack food with which the President makes a point of being photographed during political campaigns but otherwise almost never eats.